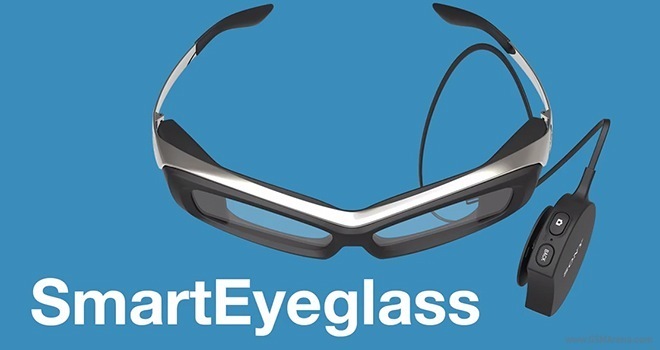 Sony announced that it has its own Google Glass competitor in the works called SmartEyeglass. A software development kit for the gadget is already available to interested developers. Sony SmartEyeglass packs a number of sensors that include CMOS image solution, accelerometer, gyroscope, compass, microphone, and brightness sensor. Coupled with GPS location from a connected smartphone, the range of sensors help the device deliver relevant information to the user through unique hologram optics. The product’s lens has 85% transparency and is just 3mm thick. It doesn’t require vision-obscuring half mirrors to work. The monochrome display on the other hand, couples high readability with low energy consumption. The device works with smartphones running Android 4.1 and up. The CMOS camera requires Android 4.3 and up. The product you see in the image above is a rather ungainly looking development prototype with external battery. I truly hope that by the time it reaches regular users, Sony SmartEyeglass will look considerably better.